Wilkesboro, NC -- The Wilkes Heritage Museum is pleased to announce the Fifth Annual Blue Ridge Music Hall of Fame dinner and induction ceremony at the Stone Center for Performing Arts on Saturday, June 9, 2012. The 2012 inductees include: George Hamilton IV, Nationally Known Artist; Robert "Tut" Taylor, Master Musician and Tradition Bearer; DeWitt "Snuffy" Jenkins, Regional Musician; David Holt, Recording Industry; The Chuckwagon Gang, Gospel; Cindy Baucom, Promoter, Organizer, and Special Contributor; Charlie Poole, Pioneer Artist; William "Oliver" Swofford, Honorary Inductee; and Dr. T. R. Bryan for a special Wilkes County Heritage Music Award. George Hamilton IV was born in Winston Salem in 1937. When he was twelve he bought his first guitar and persuaded his parents to allow him to travel alone by bus to Nashville. In 1956 he began recording for Colonial Records, but later he moved to Nashville and into the field of country music. Chet Atkins got him signed to RCA and was instrumental in having this person invited to join The Grand Ole Opry, where he has been a member since 1960. He earned his familiar title of "International Ambassador of Country Music" when he became the first American country singer to perform in The Soviet Union and Prague. Robert "Tut" Taylor was born in Baldwin County, GA on November 20, 1923. 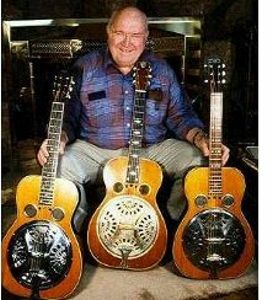 He began playing mandolin when he was twelve and later acquired a six string National-Dobro lap steel and started playing it with a flat pick. He moved to Nashville where he opened GTR, a music store and repair shop, bought a Nashville sign shop, opened the Old Time Pickin Parlor, bought the former Billy Grammer guitar factory and started manufacturing the "Tennessee" line of stringed musical instruments. He has picked and recorded with a who's who list of some of the most innovative and famous musicians of the era. He has been a friend, mentor and personal booster to many young and upcoming musicians. DeWitt "Snuffy" Jenkins was born in Harris, North Carolina on October 27, 1908. He started entertaining at age five doing a clog dance for a sawmill group and later playing a fiddle, however, he could not use the bow, so he plucked it like a mandolin. He could play almost any acoustic instrument, but switched early from guitar to banjo because the strings hurt his fingers. He emulated pickers like Smith Hammett and Rex Brooks experimenting with using three fingers to try to play a more melodic rhythm. He was the first known banjoist to play that style on the radio. His band went to Columbia, South Carolina to perform on radio station WIS where legendary announcer Byron Parker, joined the group, renaming them "Byron Parker's Hillbillies." It was Parker who gave him his nickname "Snuffy". David Holt is a musician, storyteller, historian, television host and entertainer, dedicated to performing and preserving traditional American music and stories. He plays ten acoustic instruments and has released numerous award winning recordings of traditional mountain music and southern folktales. Holt is also well known for his television and radio series. In 2002, David and Doc Watson won two Grammy Awards for Best Traditional Folk Recording for Legacy, a three CD collection of songs and stories reflecting Doc Watson's inspiring life story. After college, he moved to western North Carolina and immersed himself in the vital folk culture there. There he discovered folktales and true-life stories, which he began integrating into his concerts. He founded and directed the Appalachian Music Program at Warren Wilson College in Swannanoa, North Carolina. It is the only program of its kind in which students study, collect and learn traditional music and dance. The Chuckwagon Gang began performing at radio station KFYO in 1935. The group moved on to other radio stations, becoming more popular with each one. They were signed to an exclusive recording contract with American Record Corporation. They recorded twenty-two titles of both gospel and western songs. Their contract and master recordings were purchased by Columbia Records where they remained for thirty-nine years, during which time they recorded 408 known masters. They've appeared in movies, been voted "Number One Gospel Act in America", and been inducted into the Gospel Music Association's Hall Of Fame. Their rich history and music now spans eight decades. Cindy Baucom has pursued a passion for Bluegrass Music as an award winning broadcaster, producer, promoter, singer, musician, writer, photographer and MC. Her national radio show went into syndication in 2003 with distribution by the John Boy & Billy Radio Network. Her radio career started at her hometown station, WKSK in West Jefferson, NC and continued regionally over the next fifteen years at WKBC, North Wilkesboro, NC and WFMX, Statesville, NC. She was elected to the Board of Directors of the International Bluegrass Music Association for two terms and serves as chair of the IBMA Membership Committee. She was producer of the 2008, 2009 and 2010 IBMA Awards Show at the Ryman Auditorium in Nashville, TN. She has been involved with MerleFest since its beginning in 1988 and started serving as MC in 1990. She was producer on the 2011 Bluegrass release, "In a Groove" by her husband, Terry, bringing together some of the top names in Bluegrass for these recording sessions. She feels fortunate to have been presented the opportunities to promote the music she has loved all her life. William "Oliver" Swofford was born in North Wilkesboro, NC in 1945. He began singing as an undergraduate at the University of North Carolina at Chapel Hill in the early 1960s. He was a member of two music groups — The Virginians and, later, The Good Earth. His clean-cut good looks and soaring baritone voice were the perfect vehicle for the up-tempo single entitled "Good Morning Starshine" from the pop/rock musical "Hair", which reached #3 on the Billboard Hot 100 in July 1969, sold over one million copies, and was awarded a gold disc by the R.I.A.A. a month later. Later that fall, a softer, ballad single entitled "Jean", (the theme from the Oscar-winning film The Prime of Miss Jean Brodie) bested his previous effort by one, reaching #2 on the Hot 100 and #1 on the Billboard Easy Listening chart. Dr. Thomas Rhudy Bryan, Jr. (Doc) was synonymous with love for all other human beings far beyond himself. He was never present in any one place for very long before the sounds of music could be heard around him. He was always drawn to music, especially the pure sounds of old Country Music, Bluegrass, Folk and Americana styles of music. Doc Bryan encouraged local musicians by attending their performances and also by financially supporting them. Doc Bryan's lifelong love of traditional music gave him thousands of hours of listening pleasure and gave him a wonderful bond with so many of the talented and good people of Wilkes County. He would want the Traditional Americana Music of this area to continue to be promoted and preserved for future generations to enjoy as he did. Of course, he was known for his active membership in the Blue Ridge Music Hall of Fame. His participation in that organization was a highlight to his promotion of traditional music in the area. Sponsors for this event include the Town of Wilkesboro, Wilkes Income Tax Services, Dwight and Anne Pardue, Kulynych Foundation, A-1 Self Storage, Wilkes Regional Medical Center, Johnson Oil Company, Mike's Body Shop, Timothy D. Welborn, Wilkes Steel, Holiday Inn Express, Isaac G. Forester, Knee-Deep in Bluegrass, Jim and Rose Andrews. The Wilkes Heritage Museum strives to collect and preserve historic structures, artifacts, and documents of Wilkes County and serves as a resource center for every Wilkes County citizen and visitor. Through exhibits, educational programs, performances, and research, the Wilkes Heritage Museum interprets the history of Wilkes County and western North Carolina. The Blue Ridge Music Hall of Fame is a component of the Wilkes Heritage Museum and exists to showcase and preserve the rich musical heritage of the greater Blue Ridge Mountains area..